The 2018 season was a turbulent one for the Minnesota Twins, and for some of their heralded upcoming talents as well. Two prospects who ranked among our top five a year ago now find themselves outside of the top ten. But that's not necessarily damning in a robust system that shows well here in the 11 through 15 range. It feels like a lifetime ago that the Atlanta Braves were handed severe sanctions for circumventing MLB's international signing rules, with GM John Coppolella banned for life and nine of the organization's signings released back into free agency. (Especially since Atlanta's internal rebuild coalesced so beautifully anyway in 2018.) But it was just last offseason that the Twins were able to capitalize and scoop up Severino, who enjoyed a solid rookie-level debut with his new franchise. In 49 games at Elizabethton, Severino posted a .745 OPS that was nearly identical to the Appalachian League average (.746). He did so as an 18-year-old switch-hitting middle infielder, in a setting where the average player was two years older. His eight home runs tied for the league lead among second basemen. Already closing in on 200 pounds as a teenager, Severino doesn't have much speed to speak of (he hasn't stolen a base in 107 games as a pro) and will probably end up at a corner spot defensively, so his bat will probably have to carry him. But there's plenty of potential in that department. "He’s like Alex Kirilloff—his swing stands out from the others,” VP for player personnel Mike Radcliff told Baseball America when the Twins signed Severino. Not a bad comp. Since being drafted by the Twins as a second-rounder in 2016, Rortvedt's offensive game has lagged behind his relatively advanced defense. In that scope, his 2018 season has to be viewed as a success; between two levels of A-ball, the lefty-swinging Wisconsin native posted a .710 OPS, improving by more than 100 points on 2017's underwhelming mark (.599) at Cedar Rapids. He certainly wasn't dominant at the plate following his midseason promotion to Fort Myers, but his approach was exemplary, with a 0.72 BB/K ratio that ranked second-best among Florida State League catchers with 100+ PA. At this point we're just waiting for a bit more power to emerge, which seems feasible as he keeps growing and adding strength. He totaled four home runs with the Miracle after hitting one in Cedar Rapids, the last a grand slam in late-August as part of a six-RBI outburst. As a receiver, Rortvedt draws high marks. His excellent arm continues to control opposing run games, as he threw out 37% of base stealers last year following 2017's 36%. He figures to compete for a spot at Double-A this spring, but will have to fend off the next guy on this list. I noted in recapping last year's list that while the system was generally balanced, "the notable area of concern is catcher." Rortvedt and Mitch Garver were the position's only representatives in the Top 20, and Garver would soon lose his prospect eligibility. 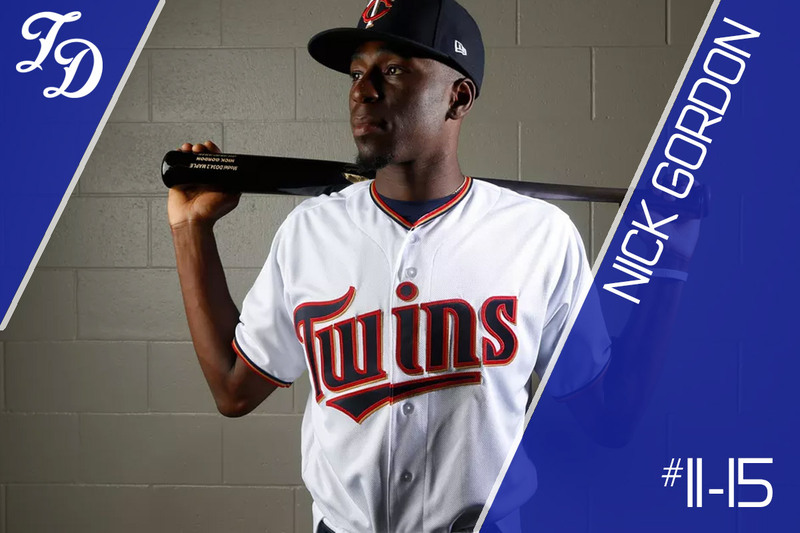 So Jeffers immediately took on a great deal of importance when the Twins drafted him out UNC Wilmington in the second round, 59th overall, last June. He was the fourth catcher to come off the board, and the second collegiate backstop. Answering the call, Jeffers arrived with a thunderous debut in pro ball. Although you'd generally expect a successful college hitter (Jeffers put up a 1.095 OPS with 16 homers in his final season at Wilmington) to catch on quickly in the low minors, Jeffers surpassed all expectations offensively, slashing a ridiculous .422/.543/.578 in 29 games at Elizabethton before moving up to Low-A, where he finished at .288/.361/.446 in 36 contests. Jeffers and Rortvedt are two sides of the same coin, inspiring plenty of confidence in one dimension with less polish in the other. They're at roughly the same stage of development. It's tough to say at this point which one's more likely to emerge, but the Twins are much better off for having both of them in the system. In the plot line of Gordon's career, you can pinpoint the moment where his prospect stock absolutely peaked, and then embarked upon an abrupt nosedive. It was on May 22nd, 2018, when he was promoted to Triple-A and suddenly everything began to fall apart. Gordon had torn it up in Chattanooga over the first two months, slashing .333/.381/.525 to back up his preseason #3 ranking on Twins Daily's prospect list, but at Rochester his limitations took center-stage. Gordon's offensive potential was always based more on projection than production. That he was able to remain a regular fixture in national prospect rankings despite never cracking a .750 OPS through four years speaks to the prestige of his pedigree. In Triple-A, the lack of power and patience caused him to tank. He endured multiple long hitless stretches. In his final 40 games he batted .166 with three extra-base hits in 170 plate appearances. Even with the context that a 22-year-old Gordon was young for the International League, it was tough to find silver linings. Meanwhile, the questions about his viability at shortstop gained more weight, as Gordon ceded a higher percentage of playing time than ever before – nearly one out of every three starts – to second base. An eventual move across the bag was generally assumed, given his lack of standout arm strength, but if Gordon can't play short in the majors his need to add offense is magnified. To that end, Gordon is said to be focused on gaining weight (and strength) this offseason. The Star Tribune reports that he's spent significant time at the team's facility in Fort Myers. If it all comes together at the plate, he'll have no trouble providing value at either middle-infield spot. Added to the 40-man roster in November, his options clock will start ticking this season. In the plot line of Gonsalves' career, you can pinpoint the moment where his prospect stock absolutely peaked, and then embarked upon an abrupt nosedive. It was August 20th, 2018, when he arrived in the majors following an unconscious stretch at Triple-A and delivered the first in a series of clunkers. Over his first four MLB starts, every flaw in the left-hander's game was exploited. Batters teed off on his low-velo arsenal, batting .414 and pushing across 16 earned runs in 12 1/3 innings. He constantly struggled to find the zone, with 13 walks and a 57% strike rate. He threw 287 pitches and induced 17 swings and misses (6%). To his credit, Gonsalves turned things around and finished on a strong note, allowing two earned runs and four hits over 12 1/3 innings in his last three appearances, all following an "opener." During this stretch his strengths were more visible – namely a long-standing ability to limit hard contact – but he still was wild and unable to miss bats, reminding us of the tightrope he walks with limited stuff. Despite his impeccable numbers throughout the minors, which were as good as ever as he climbed past the top rung, it was always difficult for analysts to envision Gonsalves as an overpowering major-league starter. In August and September, we saw why. Gordon and Gonsalves in 2018 were both prime examples of weaknesses being exposed at the highest levels. But they're also both under 25, with ample development time ahead of them before options run out. It's important to keep in mind the positive attributes that earned each a spot in the top five a year ago. At least each one now has a precise idea of what needs improvement. In the words of Henry Ford: "Failure is simply the opportunity to begin again, this time more intelligently." New pitching coach, Wes Johnson, has the moniker "The Czar of Velocity" - maybe he can add a tick or two to Gonsalves' fastball to go with his plus change-up. However, as Nick alluded to, it's going to be command of his pitches that determines how effective he will be moving forward. Ben Rortvedt actually hit 4 homeruns with the Miracle. 2 in one game at Bradenton. If you can hit at all in the FSL that's saying something, specially as a catcher in that heat and humidity. So far, in his young career, the team he is playing for makes the playoffs. Elizabethton (2016), Cedar Rapids (2017), and Ft. Myers (2018). I don't think that's a coincidence, he is a blue collar winner. Pitchers love him and he's a rock behind the plate. You hear his voice on the field, and in the dugout all the time, which usually means a great clubhouse guy. There are alot of things that go into being a successful player, not all of them are associated with an acronym. At age 21 Ben is progressing well. The front office must think so, because he is a Non-Roster Invitee to Spring Training this year, and that was a short list prospects this year. The Twins have a lot of great prospects all around the same age. Given Garver's concussion issue, it is great we have a couple of catchers here.Can see why the Twins went for Grandal (though is looks like more of a value play). Both of these two catchers are at least 2021 prospects.Either or bothcould be good, but hope the Twins find more depth here. Fact the both Gordon and Gonsalves find themselves out of the top 10, shows how much this system has grown over the past two years.Next wave is hopefully coming, and maybe we do not have the number of top end prospects of the White Sox, but Twins certainly have the depth in the system.That is a good sign. To play Devil advocate, you could also say it shows not all top prospects make it right away. Was excited to see you have Rortvedt in your Top 15.Have been a believer for a couple years that he will be the Twins main catcher for much of the next decade. Will be interesting to see if the G'men can get their careers back on track after last year's blips. I hated the Jeffers pick when the Twins made it because it seemed like a reach but what he did this past year in Short Season ball really changed my mind.I am a big fan of Jeffers bat.I can't remember any prospect that had OPS of 1.095 in the Appy league since I have been watching.I was very impressed by what he was able to do.Granted he came down some in Cedar Rapids but his numbers were still good.I think the Twins did well picking him when and where they did.I will be watching him this year expecting great things. I'm a believer in Rortvedt, but he needs to keep working on his hitting. Last year was definitely a success, but he certainly hasn't answered all the questions yet. It will be interesting to see where Rortvedt and Jeffers start; I suspect that if Rortvedt gets his shot at AA, Jeffers will start out at Ft. Myers, but I would be surprised if they both start out in the same level they finished last year with an eye towards early season promotion. Personally, I think I would be more aggressive with them both and start Rortvedt at AA and Jeffers at high A.
Rortvedt has the catching skills to work with more developed pitchers and we need to see if his bat can play at higher levels of competition. (and if he needs to repeat AA...ok) Let's see if Jeffers bat is what it looks like in a tougher league and competition closer to his age level; what are we gaining by having him beat up on younger guys? I'd also like to see how he does catching guys who have a little more advanced skills too. Gordon and Gonsalves are getting near make or break points. If Gordon can't hit better, he's gonna bust. He's been pushed fairly aggressively, so some adjustment is understandable, but he needs to find an approach that works for him at the plate. Gonsalves has to find better control. He's been able to generate enough K's at every level, so I suspect he can do better than his K/9 ratio in MLB last year, but the BBs have got to come down. He doesn't have the overwhelming stuff to be "effectively wild", so he needs to have the command and control working for him. Frankly, I'm nervous about his future. Not to throw cold water on anything, because I also like Ben a lot and expect him to be a big leaguer for some time once he gets to the top, but we shouldn't read a whole lot into a catcher being invited to big league ST camp to start the spring. With pitchers reporting earlier than everyone else, the Twins (like other MLB teams) typically invite almost every catcher with a couple of years of experience to camp when it opens. With all those pitchers showing up, there's a need for a lot of catchers to handle bullpen sessions. Nevertheless, it's a great opportunity for him to get a taste of the bigs and give him a little extra motivation to get there when he can stick. Not that he needs a lot of extra motivation. The guy is driven. Ben Rortvedt actually hit 4 homeruns with the Miracle. 2 in one game at Bradenton. If you can hit at all in the FSL that's saying something, specially as a catcher in that heat and humidity. Ah yeah, good call, I had it backwards. He hit one HR in Cedar Rapids then 4 in Ft. Myers. Article updated. And yes, agreed, his performance in the FSL was quite impressive considering the context. I would not be excited about his ST invite.With all the arms needing work, we always have extra catchers around - lots of them.I think some marginal catchers have made a career of ST catching. This list has some disappointments.Ryan Jeffers has passed Rortvedt and I expect that to become an even greater separation this year.Gordon really flatlined and we have been counting on him.It is a shame to see him fall this far and it is deserved, not just the good players in front of him.Two years ago I expected him to be a Twin this season, now I wonder if he can be a major leaguer.The same with Gonsalves.I really hoped he would break through last year. For three of the players I call this the disappointing section of the rankings. This list has some disappointments. Ryan Jeffers has passed Rortvedt and I expect that to become an even greater separation this year. Gordon really flatlined and we have been counting on him. It is a shame to see him fall this far and it is deserved, not just the good players in front of him. Two years ago I expected him to be a Twin this season, now I wonder if he can be a major leaguer. The same with Gonsalves. I really hoped he would break through last year. Situations like this with Gordon and Gonsalves is exactly why I'm in favor of trading prospects for established MLB talent 9 times out of 10. Minor leaguers have a peak value prior to reaching the majors. Gordon and Gonsalves' peak was 2 years ago when they were on top 100 prospect lists. IMO Kirilloff is at his peak right now. I have lost some confidence in Gordon, but to say this is a make or break year is off. He's 22. In AAA. Fangraphs has reasonable confidence in Jeffers staying a catcher. I too hope they are aggressive with both catchers. Agreed... I think giving up on Gordon would be silly. He's' not big, but he can hit. We all know he needs to keep getting stronger, but with his swing and approach and knowledge and skill, worrying too much about his struggles in the 2nd half in AAA at 22 might be a bit much. But I do think it would be nice for him to get off to a fast start there in 2019, if only for his own confidence. I do know that the Twins really like Jeffers behind the plate, like his pitch framing. I agree this isn't the make or break year, because there isn't really anybody pushing him to the bench in AAA, but he if hits under .200 for another 40 game stretch, he should be really worried about 2020, because he will be the older guy pushed a side for the next prospect. I'm assuming Luke Raley and Jhoan Duran aren't going to be listed in the top 10 but I would put both ahead of Ben Rortvedt.He is probably outside my top 20. I think there's a massive difference between peak fan hype and peak value, Vanimal, and I think we tend to conflate the two things without really having a very solid idea about how much real trade value these prospects have. Think of it this way: Gonsalves was picked after 109 other guys were selected. You're right in saying 9 times out of 10 these players picked from. say #40 and after flame out, and that's the case in 2013, where maybe 5 of the 70 players selected in front of Gonsalves look to be amounting to anything. But even with his surprising success, and even if one could somehow ascertain his peak minor league value, what kind of MLB talent do you think he fetches? Probably a Blake Parker. Is it worth giving up on a gamble like Gonsalves for that? It is indeed far too early to give up on Gordon. His AA numbers last year were good. I have no idea what the bad performance at AAA was caused by. Still development is rarely linear. I can remember Denard Span dropping way down on prospect lists because of his performance in the high minors. Gordon seems to be a high character guys, with plenty of talent and pretty well developed skills. I expect to see him succeeding in the majors, soon. I 2nd the thoughts on Rortvedt as well. I expect the hitting to get better and his catching skills are well respected. A long major league career seems likely. Yes. I like Gonsalves and Gordon. I think very highly of Rortvedt and Severino. But I'm sick of this organizational philosophy of sitting on these prospects until their fire has been completely snuffed out. What's worse to me is year after year we are told how good our prospects are. Yet year after year we are signing so-so FA's to play at Target. This OD could see as many as 8 first year FA's suiting up again. I'm tired of being sold the hope of our farm system and it not being utilized. End of rant. Thanks all for the rankings. It's great reads. I don't think anybody has or is saying trade Gonzo for a mid tier relief pitcher, they are saying or were saying package him and a few other prospects for a Major League talent. To me, the consideration about moving a minor league asset has to be about him becoming redundant, about having a better alternative at the same stage of development. It can't be about timing his trade value and then timing his trade, because you'll often get meager returns at the moment of opportunity, whether the guy flames out or becomes a star. Buyers overpay at the trade deadline most of the time, I think. If I'm GM, I'll dangle Gordon or Rooker because I have another better alternative close to the majors. I don't let Gonsalves go. Not until I have a couple other better alternatives than him at the cusp in AAA. Maybe they do though. If Rooker reaches "peak value" early this year, I'd much prefer to deal Austin or Cron for prospects at the deadline than to deal Rooker for two months of someone's Fernando Rodney. Fans over-hyped Gonsalves. It's doubtful he's viewed as a disappointment by the organization but rather as a step up from typical for the #110 selection. Gordon was over-hyped by the fans, and now he's probably under-hyped. It's too early for the Twins to conclude enough about Rortvedt, let alone us as fans. There's a ways to go for him, and for Jeffers too. Did we think all that much of Garver at the same stage? I honestly an't remember. Gordon was a top 75 or higher prospect on several lists. I don't think this is about fans......not even a little.